This is the first book in a trilogy written to chronicle the life of everyone’s favorite Star Wars outlaw, Han Solo. Despite the fact that this trilogy is not by any means new, it is a great read for all of you Star Wars fans who want some background on the characters in the films. 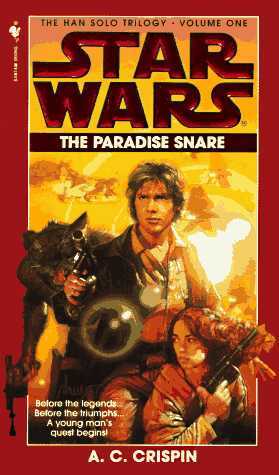 Han Solo is a young man living on a smuggler’s ship when the story opens. Despite the fact that he was found an orphan and raised to be a thief, he has aspirations to be a great pilot and longs to attend the Imperial Academy. From the second the story opens, you get the kind of great action sequences that fans have come to expect from Star Wars. Join Han as he escapes one treacherous situation after another and manages to charm his way through most of them. This story covers the years that Han is about 19 and 20 years old, and leads up to his entrance in to the Imperial Academy. You will get a ton of backstory here, including his alliance to the Wookiees, his knowledge of many languages, and some of the reasons that he is so independent and hard-hearted. Hand this book to fans of the original Star Wars films, and any sci-fi lover.